Do Psychic Phone Readings Really Work? With clients all over the world, international psychic medium Corbie Mitleid explains why phone readings can be as accurate as psychic readings in person. When a Psychic or Tarot reader states they deliver "detailed" answers, how how can you tell? Corbie Mitleid explains what a detailed reading should have. When a stranger INSISTS on giving you psychic information, what do you do? 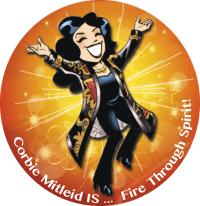 Psychic medium Corbie Mitleid tells you how to stay safe and make them stop. Everyone can have psychic development. With this simple exercise, Intuitive Corbie Mitleid explains how you can tune your inner radio for reception. Psychic Medium Corbie Mitleid shares books and authors she recommends to every student and client during a Spiritual Awakening for mind and soul expansion. The mind is a powerful tool, and holistic medicine knows it! Psychic Medium Corbie Mitleid shares her favorite visualizations to support health and wellness. Many Lightworkers aren't comfortable with the idea of asking for money for what they do. Corbie Mitleid explains why you should charge what you're worth! As a professional reader, don’t be afraid of a good joke. Psychic Medium Corbie Mitleid gives psychic tips on why humor can be a great tool in a reading. All the best psychics & Tarot readers know they are only as good as their health and wellbeing! Corbie Mitleid shares why "be good to yourself" is a spiritual practice.